Sunday Reads: Make Sad Keanu Smile - Watch PERMANENT RECORD On Its 30th Anniversary | Birth.Movies.Death. Before going on excellent adventures or checking into the Continental Hotel, Keanu Reeves was in drama club. 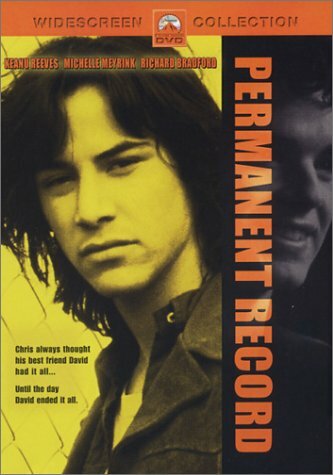 Four score and three decades ago, between River's Edge and Bill & Ted's Excellent Adventure, Keanu Reeves starred in the criminally under-appreciated teen drama Permanent Record. While critics have compared the plot of Marisa Silver’s film to that of an After School Special, it’s actually one of the more enlightened portrayals of teen suicide and the effects it has on those left behind. Reeves gives a compelling and disparate performance as Chris Townsend, an underachieving high school senior struggling to make sense of life after his best friend’s suicide. Considering the film’s authentic representation of high school and its honest approach to this important subject, it's surprising how little it’s been seen or discussed over the years. Moreover, it contains a strikingly emotional and dramatic performance from Reeves rarely seen in his repertoire. Permanent Record starts out focusing on the life of David Sinclair (Alan Boyce), a popular and gifted high school senior with a loving family. In addition to maintaining his grades, David is a brilliant musician tasked with writing music not only for his band, but for the school’s upcoming production of H.M.S. Pinafore. Upon learning that he’s been accepted to a prestigious music college, the pressure and everyone’s expectations prove to be too much for him and he stops it all by jumping off a cliff about thirty minutes into the film. Having mailed a package containing a suicide note and his unfinished music to his best friend and bandmate, the film’s focus shifts to Chris Townsend (Reeves). Reluctant to put much effort into anything he’s done in the past, Chris is suddenly forced to take on the responsibilities David left behind. Leaving him to deal with the same pressures, along with the nagging questions of why his best friend killed himself and whether there was anything he could’ve done to save him. Keanu is, of course, the main draw to this film. However, the cast of both teachers and students create an atmosphere that will transport every drama/theater nerd back to their glory days in the high school auditorium. The majority of everyone’s screen time is spent planning a memorial service for David, either at their cliff-side hangout or during rehearsals for the play. Shifting the storyline from David to Chris and his friends after his death inspires sympathy on both sides of the tragedy. Introducing David prior to his suicide provides insight into his state of mind and the lives he enriched along the way. Once he’s gone, the grief spreads not just to those who were closest to him, but throughout the entire school. His suicide raises many difficult questions due to the fact that he was perceived by his peers as the guy who had it all. In the aftermath of his choice they’re left wondering: If he couldn’t make it, how can anyone? A strong supporting cast, including Michelle Meyrink, Jennifer Rubin, and Pamela Gidley represent the kids most affected by David’s loss. Each one of them genuinely feels like someone you sat next to in class or walked past daily in the hallowed halls of your youth. Richard Bradford gives an understated but powerful performance as the type of principal every school deserves, expressing concern for each student and encouraging a screw-up like Chris to push himself. Barry Corbin and Kathy Baker are memorable as David’s grieving parents, who Chris turns to repeatedly for guidance in his father’s absence. Set to a soundtrack produced by Joe Strummer and including a brief cameo of the late Lou Reed, the film illustrates how music and the arts are the saving grace for these kids. When the memorial service they have planned to play David’s music is canceled, Lauren (Jennifer Rubin) takes to the stage for her solo during H.M.S. Pinafore and siezes the moment to pay an incredibly emotional tribute to their friend. If Keanu’s performance isn’t what ends up standing out for you, her moving rendition of J.D. Souther’s “Wishing on Another Lucky Star” will stick with you for the long haul. Yet, there is something unique about Keanu’s performance here that we've only seen glimpses of in other films. Made prior to Bill & Ted’s Excellent Adventure – and, in turn, the subsequent attacks on his intelligence and acting ability – Keanu seems more uninhibited and emotionally raw in this role than in those he played after Ted Logan. Sure, Chris Townsend can be reduced to some combination of his various roles – mix Matt from River’s Edge with Ted and you’re on the right track. However, what’s fascinating in this case is that he doesn’t seem to be holding anything back during the emotionally dramatic moments in Permanent Record. There are multiple scenes where his character breaks down in body-wracking sobs and his performance is not only effective, it’s utterly heartbreaking. Perhaps it wasn’t so much the critical response after Bill & Ted that limited Keanu’s options for more dramatic roles, but the public’s inability to separate him from that character. Had he never done the film, maybe he would have had more varied opportunities. Then again, who would want to live in a world without the Wyld Stallyns? Regardless, the point is that there's a quality to his performances in earlier films like this one and River’s Edge that has only resurfaced a few times since the persona of Ted took over – My Own Private Idaho being one other example. His venture into action films has proven to be a great move for him and there’s no doubt the man has been creating iconic characters in that genre since the early ’90s. Still, watching Permanent Record makes you wonder what might have been had Keanu Reeves been given more dramatic roles like this one. Thankfully, he still has a long career ahead of him, so it’s possible we’ll get to see more glimpses of his dramatic potential. Meanwhile, we can always revisit these early gems, where he proved he has what it takes to be more than just a laugh or an action star.